This has been a tough year so far, business wise. We have been struck pretty hard by the double whammy, decrease in the volume of business and increase in cremation rate. A few of the funeral trade writers have made reference to this saying that it’s going to hit more and more firms. I knew this was coming. I watch the numbers closely and keep track of the other firms in the area and what they’re doing too. I know they are having the same challenge. We are in the Dip before the baby boomers, It’s the reduced birthrate and immigration rate in the US from 1925 to 1945. It means there are just less people going to die for the next few years. The death rate is down 7% in our area from last year. Now combine that with a major shift towards cremation, (I’m at 65% so far this year) which means less total dollars coming in, and my skivvies are getting tighter every day. Let’s look at the numbers in a typical scenario. And this can happen to you real quick. What would your books look like if this year your income dropped by $200,000.00?? Chinese caskets and selling more thumbies isn’t going to help a whole lot. This isn’t about making more money, it’s about trying to stay in business. Email me if you want a spreadsheet so you can plug in your own numbers. I have a feeling there are lots of funeral homes out there like mine. We’ve got buildings and staff geared towards the way we did business 35 years ago. We still have a percentage of people who want it the old way. But that percentage is shrinking and the amount of people who want less of our traditional offerings is growing. Yet our expenses remain the same (Staff, Benefits, and buildings, autos). So what can you do? I have reduced my staff and found the best deals on benefits. But you can’t just close up a location and sell the building next week to put money in the checking account. In West Michigan the unemployment rate is close to 15% and less than 5 commercial properties sold last year. The local banks are all hurting. So we hold off on building repairs, make the cars last another year, do more of the maintenance ourselves and I work more hours instead of bringing in the part time folks. All of which hurts the overall economy of the area. It’s a vicious circle. The people still need us when their loved ones die. But they are watching their dollars closer too. And I feel for them because I’m in the same position. This year it has been very common for people to come in and say “this is all we have to spend and there isn’t any more”. So I give them the best deal I can, and still provide as much service as I always do. I wish there was an easy answer, but there isn’t. I keep hoping for the economy to turn around and people to feel more secure about their futures. But I think it’s going to be several years before that might happen. Until then we’ll just keep hanging on. My great grandfather and grandfather made it through the Great Depression helping people when they needed help. I still hear stories today about what they did for families when times were financially tough. That generosity seems to have been paid forward in the form of loyal customers. I sure hope that history will repeat itself. As of late, it’s cemeteries, that I have had challenges with. Example – A family buried a man’s ashes on his mother’s grave and they wanted to place a small (6” x 9”) bronze veteran’s marker on a grave that already had a granite one for the mother. Family called the township office, talked to “Susie” (not her real name) who handles all the cemetery stuff. Susie says “NO!! One marker per grave, that’s the rule.” Mind you, that I have been to this cemetery several hundred times in the past 10 years. I’ve never met or seen Susie, ever, at the cemetery, although I have talked to her hundreds of time on the phone. Example 2 – We are at the graveside and the closed casket is on the lowering device. Family wants to place a ball cap in the casket before we lower it. Debbie, the cemetery person, says “No, can’t open the casket at the grave side, it’s against the rules” It’s a corporate owned cemetery. My director asks “Why?” She says “it’s against the rules” He asks again “Why?” She gets flustered and says “I’ll have to call my supervisor” After 15 minutes of bickering and phone calls the family is allowed to open the casket just enough to slip in the ballcap. This is all nuts. What are these people thinking? This is where I think every company and every government agency or department (and my own company too) needs a “Vice President of Common Sense”. They need someone to listen to a problem or situation and then apply common sense and “Do the Right Thing”. This isn’t hard. It’s not rocket science. C’mon people. Rules and regulations are necessary to give us a road to travel and keep us all going in the same direction. But when there is a rock in the way or a pothole you drive around it. We make adjustments. My basic rule in all of this is just help the people do what they need to do and keep within the spirit of the rules. Eventually we by-passed Susie and went right to guy who maintains the cemetery and he gladly placed the small marker right next to the mothers and it looked just fine. And Susie will never know (she never goes to the cemetery). It’s the old saying that sometimes it’s better to do it and ask for forgiveness than ask for permission and get rejected. So next time somebody gives some stupid excuse why they can’t do something, just tell them you’re going over their head and you want to speak to the Vice President of Common Sense. To review – we have had some challenges with folks, both at-need and pre-need, getting service and price quotes then going to another funeral home. Then the other firm quotes a lesser price for a completely different set of services and merchandise. Are we asking things in the wrong order? Is there a better way of giving information to folks that will help them make decisions that they will be happy with? Just so you understand, I am a systems guy. I have an engineering degree in Management Science and I really believe that if the system is designed right, it will work. So I look at this as a decision tree situation. Like in computer programming we learn to do everything with If, Then, Else statements; If you want to view the body Then we’ll need to decide about public or private viewing or Else you don’t want to view the body and we’ll move on to the next section. So this isn’t just about price shoppers, it’s about all people planning funerals. There are four main decision areas that families need to make choices in for every single arrangement. Now none of these areas and decisions is more important than the other and you can talk about them in any order. But choices that are made in each one of these areas will affect the other three areas. In general terms, after getting the biographical info, we first asked folks if they had an idea about what they wanted to do. And for years, they did. Because over 75% of the calls were the same – embalm, casket, vault, visitation, service, procession, cemetery. The only variation was which casket and which vault. And when they did choose cremation it was either direct, memorial service or rental package. Then we pull out the price list, add it all up and say this is what it’ll cost. They’d say OK. Done Deal. Things are different now. There are more options. The public is doing lots of different things. The economy is terrible and money is tight. Funeral Homes continue to get bashed in the press and there is a lack of trust. Plus the families are spread far and wide so they don’t always have personal relationship with the hometown funeral home they are dealing with. Consumers are bombarded with “Low Price” advertising for everything. Baby Boomers, no matter how well off they are, pride themselves in finding the best deal. And this list could go on for several more paragraphs. Is it time that we, funeral homes, change our approach? Do we start talking about price first? Or will that make the public think (even more than they already do) that we’re only interested in money? Can we phrase things so that people will understand that we empathize with their situation, both financial and emotional. We’re trying to help them find the solution for them that will meet all of their needs, financial and emotional. Yes we need to be paid for our services, but we’re not trying to get them to buy something they don’t need or want. Should we present folks with a piece of paper or a slide on the screen that has the 4 areas listed above and say “folks where would you like to start”? Would this help avoid sticker shock when we talk about how much everything will cost? I want to carry this conversation on more with funeral folks and with the general public. Tell me what you think. This week we had a number of at-need and pre-need price shopper issues. There were slightly different circumstances but each case had the same basic theme to it. Families came in to meet with us. We sat down, bonded with them, found out what they wanted to do and we quoted a price. In each case it was a bundled package price with multiple visitations and our full Life Story Package. We always assure people that the packages can be adjusted to their individual needs if there are financial challenges. In each case the families didn’t make a firm commitment to us or the plans and needed to discuss things. They all came back later and said they had contacted a different funeral home who quoted them a lower price for services. The problem was the other funeral homes quoted them prices for completely different sets of services and merchandise. Less visitation, a graveside service instead of a chapel service, a cloth covered casket instead of using a rental casket, basic print packages without videos, etc. In a few cases we got them to sit back down and we compared things side by side and showed them that we could do things for the same price or lower and we ended up keeping the family with us. But in one case we never even got a chance. One other interesting factor was that in each case there was a family member that was not part of the original meeting that pushed the folks to talk to another funeral home. Now I don’t want to bash the other funeral homes because I probably would have done the same thing they did. The problem is that the family asked each funeral home a different set of questions. They told us what they wanted to do, we showed them all the options and then we told them a price. Then the family went to the other funeral home and said “Clock’s quoted us this price, what can you do?” and the other funeral home says “We can do better than that” and shows them where they can do a little less services and lower price merchandise and save some money. And the family thinks they got a “Funeral” for less money. I could have done the same thing, but they didn’t ask me that question. So it goes back to this – what do we talk about first with the family? Which order do we present things? Do we talk money first, in the middle, or at the end? Do we ask “how much do you have to spend” and show them what we can do for that amount. Or do we get to know them first and then show them the options that we think are going to meet their needs the best? For all you funeral folks out there, where do you start? There are lots of factors here to consider and no easy answer. And I know I don’t have the magic answer. But I’m here to ask the questions and maybe together we can figure some of this out. I’m going to continue this discussion in my next post because I want you to think about this for a few days. Joe was a non licensed guy that worked here at the funeral home for more than 40 years. He lived across the street from funeral home and his son Thom was my best friend growing up. Joe was as dedicated as any employee could be. There wasn’t anything he wouldn’t do. He made removals and made ambulance runs before we finally got out of that business. He worked visitations, set up flowers and delivered them. He was the parking lot general, working the main gate sending hand signals down to us so we’d get the cars in the right lanes. And hollering at us young snots if we didn’t do it right. He drove the coach and even sang solos in his younger days. Now Joe was no angel. He was cantankerous old fart that loved to give you a piece of his mind. And everyone here had it out with him at one time or another. But damn, I sure wish he was around now. When I started working full time I made it my mission to learn as much as I could about the building from Joe. I studied his charts and followed him around when he checked toilets, and faucets and the furnace thermo couples. I learned where he kept all the keys for the umpteen different doors we had and the little drawers that held the secret stash of Jewish yarmulkes and shrouds. Because I knew one day Joe wouldn’t be here and somebody needed to know where everything was. Well, my main building has expanded and we added two more locations. More than 50,000 square feet in all. Roofs, plumbing, equipment, lawns, bushes, cars, telephone and alarm systems and two apartments. Sheese. And I don’t have Joe any more. He retired more than 15 years ago. I’ve tried to replace him on several occasions but nobody has come close to filling his shoes. So I do my best to keep the places up. I teach people a little at a time about all the different things that need to be done and where all the switches are. But there are days when it can be so overwhelming. I hope my Dad knows how lucky he was to have Joe. If you’ve got a Joe, be real good to him and pay him well. And make sure you thank your lucky stars. It’s Sunday morning. I have the duty today. No new calls this morning. I’ve got a visitation and scripture service here tonight. And the whole day to myself (which is nice sometimes) to get paperwork done and finish printing up stuff for tomorrows services. There are 8 names on the back board. You know the board. Yours may be white and it may be in the office, heck it might even be on the computer. Ours is an old chalk blackboard. Custom painted over 60 years ago with headings that mattered then, that don’t even make sense today. There is a column for where to pick up the minister. That’s from the days where the ministers didn’t have cars and lived next door to the church. There is a column for who’s driving the pall bearer car. We haven’t used a pall bearer car in 20 years and only go in procession to the cemetery 10% of the time. There’s a column for where to deliver chairs for the receptions after the service. When I started in working here in high school I would deliver chairs to homes in canvas bags, along with a big 100 cup coffee pot in a custom made wooden box my uncle made. Then I’d go back later and load all the chairs in the bags, toss them in a truck and bring them back. We don’t do that any more. We opened our family center for receptions over 20 years ago. Now families have their ham buns and potato salad gatherings here at our place and we do all the clean up instead of the hauling. Anyway, back to the present. 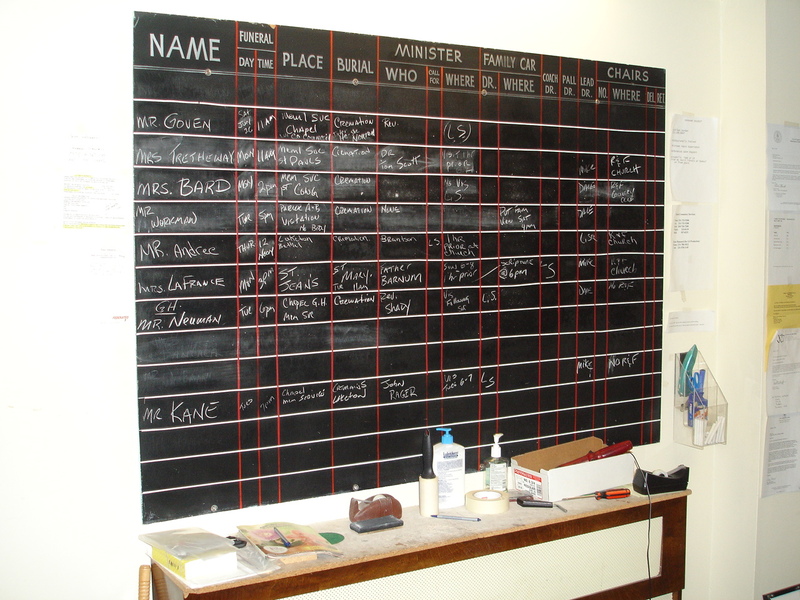 There are 8 names on the board. There is 1 burial and 7 cremations. Not a single one of these calls is what would have been considered a standard funeral when I started doing this in 1985. Back then 75% of the time it would have been visitation 2-4 & 7-9 pm with a nice 20 gauge sealer casket and a Continental vault and the same register book and the same folders with the 23rd psalm on them. Service the next day with a procession to the cemetery and then off to the church for a reception. We’d deliver the plants, planters and vases to the residence and distribute all the cut flowers to nursing homes. And damn, we were real good at that. It was like a well oiled machine. And, as my wife likes to say, we made money by accident. Back to the present, again. Of the 7 cremations on the board there are 3 church memorial services, 3 funeral home memorial services and 1 memorial visitation. 3 of the services are at night (5pm and later). We are doing full Life Story services on 5 of them, which means printing custom folders, framed Life Panels, 2 videos each and more. Plus having the video equipment set at the chapels for Life Stories and webcasting. Plus taking the portable video stuff to the church and the country club for the reception. Plus being prepared to be the Master of Ceremony at those Life Story services. Each service has it’s own little nuances and things that have to be done to customize it to the families unique needs. And we already had 3 private family viewings of dressed unembalmed bodies that lasted for at least an hour each. And I love doing all of it. I love putting on wonderful events and making people all warm and fuzzy. I love helping people say their last goodbyes. It’s just that sometimes I wish for the old days where things were regular and predictable. Things just aren’t the same any more. I am the boss, the big cheese, the head dude, the one ultimately responsible for everything that goes on in my family business. And it’s not always a very fun job. Still, I love what I do. It can fill my soul. But it can also be a very lonely place. I’ve been thinking about writing a blog for some time now. I want it to be a place for people that are in similar situations to feel like they are not alone. A place to share good times and bad times. Successes and failures. A place to share the real and the absurd, the funny and the heart warming. And I hope it helps a few people along the way. I’m calling this blog Dale-Time. Because it’s my time to reflect. It’s a little Dale time. Like mommy time or play time……Plus it’s a play on my name too. Dale Clock. Clock —- Time. Dale —- Time. Real clever, huh? I own and operate 3 funeral homes in west Michigan. The firm was started by my great grandfather in 1897. I’ve been officially working in the business since 1985. (longer if you count the car washing , grass mowing and flower delivery driving I did in high school). I attended Northwestern University on a NROTC full ride scholarship. I graduated in 1979 with a degree in Industrial Engineering. Served as a Naval officer for 5 years, made 3 overseas deployments. After my Navy time I returned to the family business, went to Worsham College of Mortuary Science and became a Licensed Funeral Director in 1985. A lot has happened since then. Some good, some bad, but all of it together has made me who I am today. I’ll be sharing some of the past, along with current events in the ever changing challenges of running a family funeral home. I hope you find some of it entertaining, some of it educational, some of it motivational and most of it worth your time. And if you run a family business too, I hope some of my words will let you know that you’re not alone out there. That somebody gets what you’re going through.